Last month on BootCraft I added 24 new drills thanks to our contributors Nadinne Wilkinson and Lori Watson which brings BootCraft to a total of 162 drills! This month our Featured Designer is someone you might recognise from our Facebook group, Roxanne Walbancke. Roxanne has been an awesome member of our community for years and shares really fun workout ideas so I asked her if she would be interested in sharing some of her workouts with us. I’ll be adding 12 of her favourite drills to the database over the month of April. At Buff Body Bootcamp (BBB) we like to celebrate that everyone is different and no one is ever left behind and we are always challenged but most of all we have fun!! I am super proud of my business. I run it all by myself as well as running a family and keeping house. It is really successful and is like my 3rd baby. BootCraft is kind of like the premium version of Bootcamp Ideas. If Bootcamp Ideas was Jet Star, BootCraft would be Qantas. Each month I add 12+ group fitness drills to a growing database of searchable workouts. 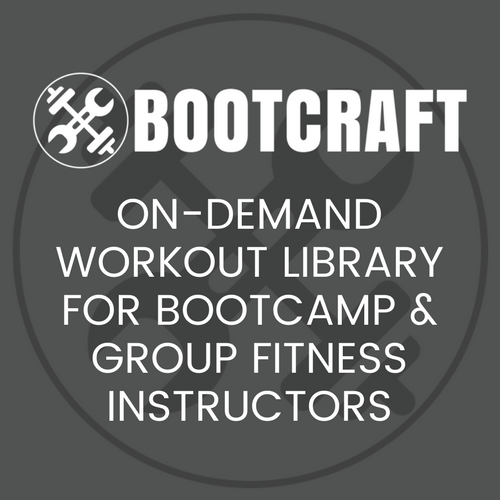 Unlike Bootcamp Ideas, which because of it’s blog format old workouts tend to get lost, BootCraft’s search function helps you find exactly what you are looking for. Which means instead of spending hours each week planning your workouts, you can get it done in minutes. When you join over 15,000 trainers and sign up to our email updates, we’ll send you a new workout or idea each week. Plus, for the first 3 weeks you’ll get our course 21 Days of Bootcamp Ideas for free. Just our way of saying thanks for trusting us with your email and time.